The year that saw an African-American become President for the first time in U.S. history also witnessed a truly remarkable silence—one that was scarcely coincidental. In all the millions of words written about a political ascent of one black man, there was virtually nothing about the descent of black leadership into well-nigh total ineffectiveness. Barack Obama’s personal itinerary was mapped in minutest detail. The larger itinerary of African Americans was mostly ignored. 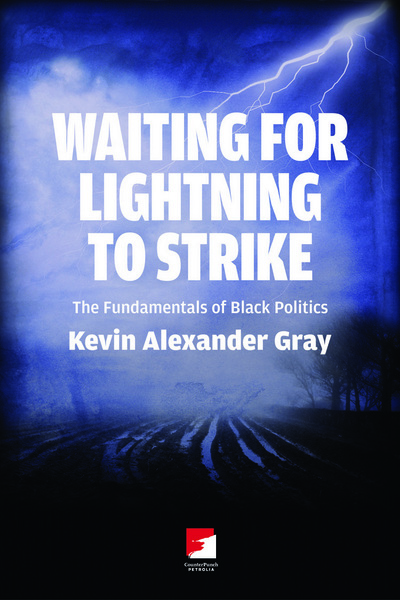 In Waiting for Lightning to Strike, Kevin Gray’s take is radical…so his focus is always ample and humane. In these passionate pages, he takes his readers into areas of darkness—South Carolina’s heritage of slavery, for example—and into the vibrancy and heat of James Brown and Richard Pryor. In essays like “Why Does Barack Obama Hate My Family?” and “”Dixie 101,” Gray’s intellectual footwork is as sure as Muhammad Ali’s in his prime, and the knockout is as deadly. Kevin Alexander Gray & his younger sister Valerie were among the first blacks to attend the local all-white elementary school in rural, upstate South Carolina in 1968. Since then he has been involved in community organizing working on a variety of issues ranging from racial politics, police violence, third-world politics & relations, union organizing & workers’ rights, grassroots political campaigns, marches, actions, and political events. He is currently organizing the Harriet Tubman Freedom House Project in Columbia, South Carolina which focuses on community-based political and cultural education. Kevin was a founding member of the National Rainbow Coalition in 1986, former co-chair of the Southern Rainbow Education Project—a coalition of southern activists—and former contributing editor of Independent Political Action Bulletin. He was also the 2002 SC United Citizens’ Party & Green Party Gubernatorial candidate. He was managing editor of The Palmetto Post and Black News in Columbia, South Carolina, served as a national board member of the American Civil Liberties Union for 4 years, is a past eight-term president of the South Carolina affiliate of the ACLU and an advisory board member of DRC Net (Drug Policy Reform Coalition). The Sun Never Sets: How did We Become an Outlaw Nation?